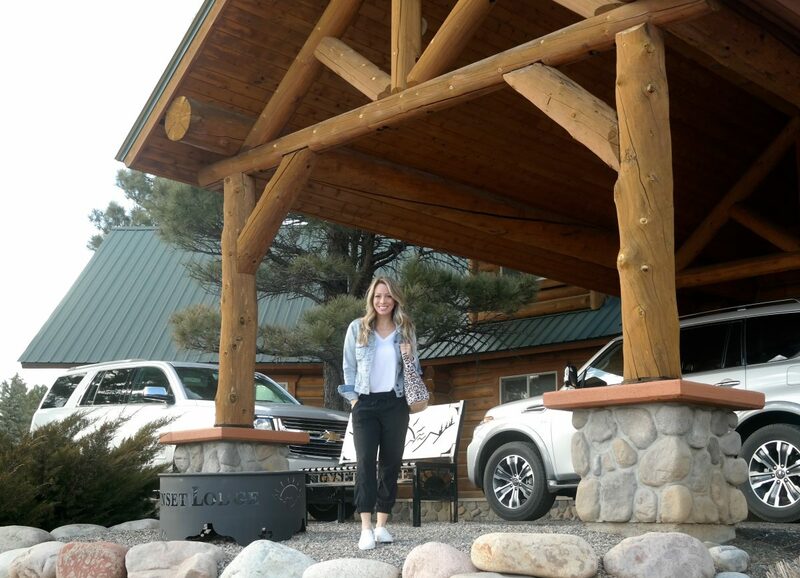 We were lucky enough to be invited back to Pagosa Springs, Colorado (35 miles north of New Mexico) where our friends’ dad has the cutest log cabin! We went three years ago with James when he was five, so we were thrilled to get to introduce Jordan to this experience! We went with three other families, a total of 17 of us! but at two years old, Jordan was the youngest. All of the other kids were eight years old and older. 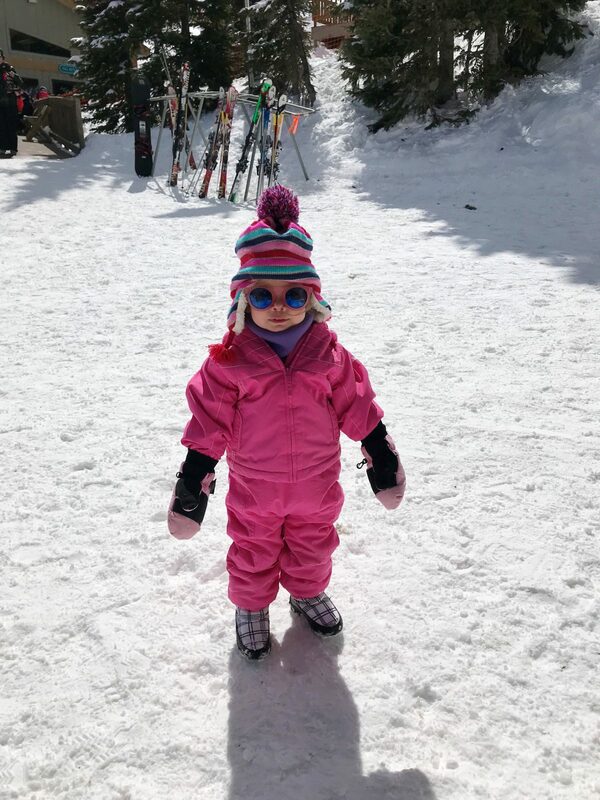 We’ve never taken a toddler into the snow skiing before, so I was a little apprehensive about what that would be like and how she would handle it. I have to say that overall, she did amazingly well- much better than I predicted! 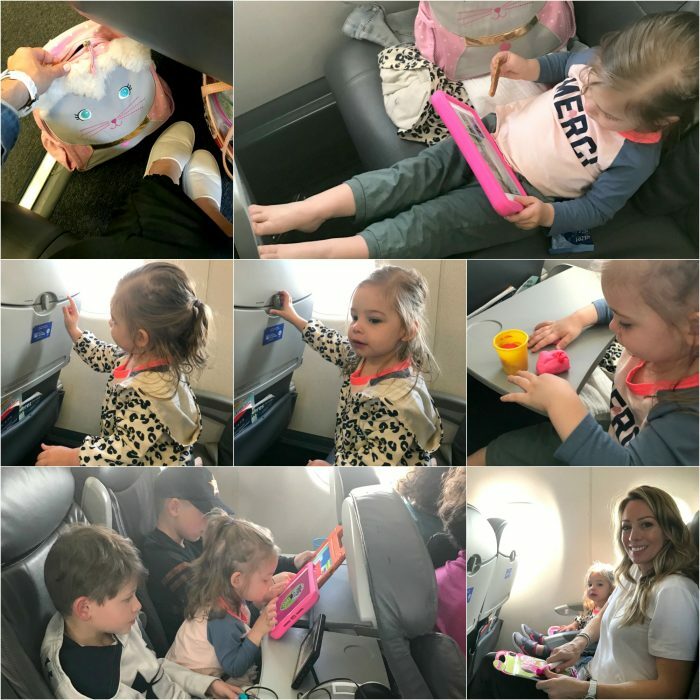 Of course, before you go, you’ll need to prepare for the trip, including arranging flights/car rentals/car seat rental (unless you bring yours)/pack-n-plays, etc. 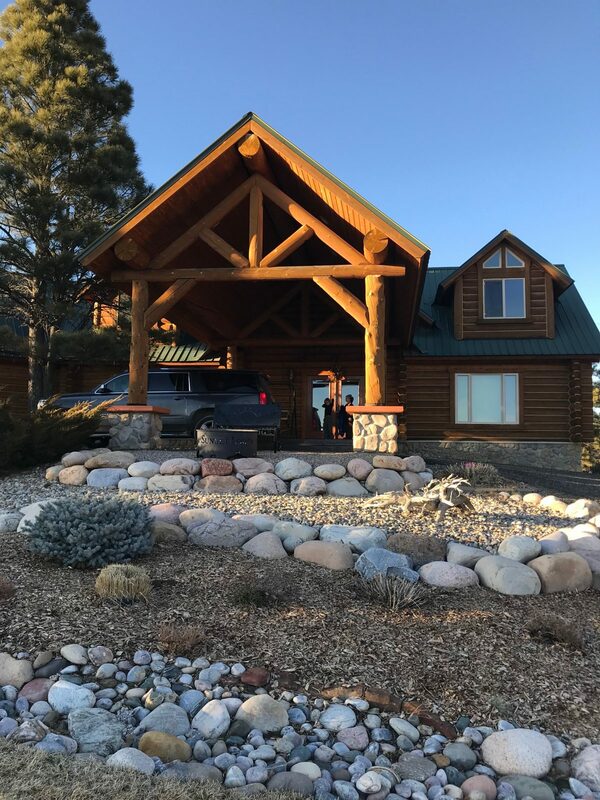 We also had an itinerary for the three days we’d be in Colorado, and there was a lot on the agenda! 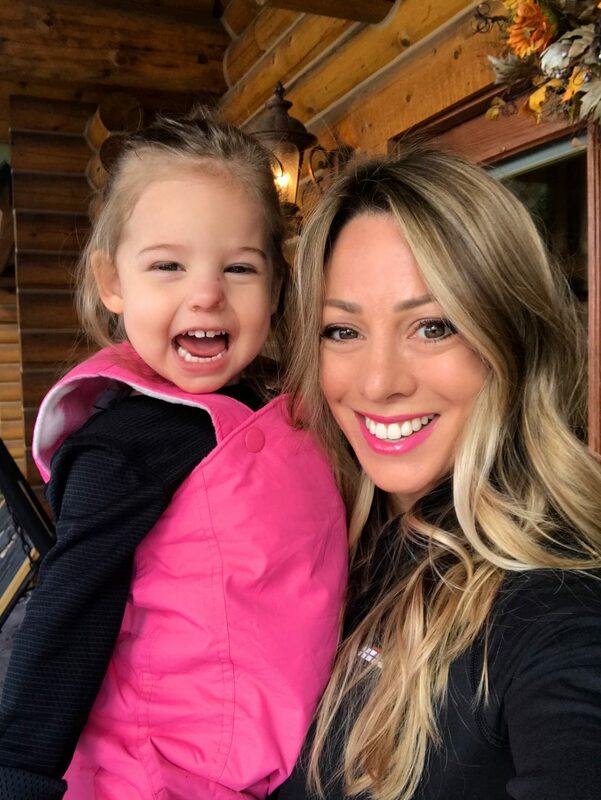 I was nervous that with a toddler who still takes naps and goes to bed early, she wouldn’t be up for all the things we had planned, and selfishly, I figured I’d be missing a lot of the fun staying back with her in the cabin. Turns out, I only stayed back one day (and of course enjoyed being with her), and she was a trooper the rest of the time. She did miss some naps, but was able to go to sleep early or sleep in to make up for it. There are lots of babysitting options through reputable online agencies if you want to research that ahead of time and get referrals and recommendations, but we didn’t do that, so I can’t endorse any of those personally. 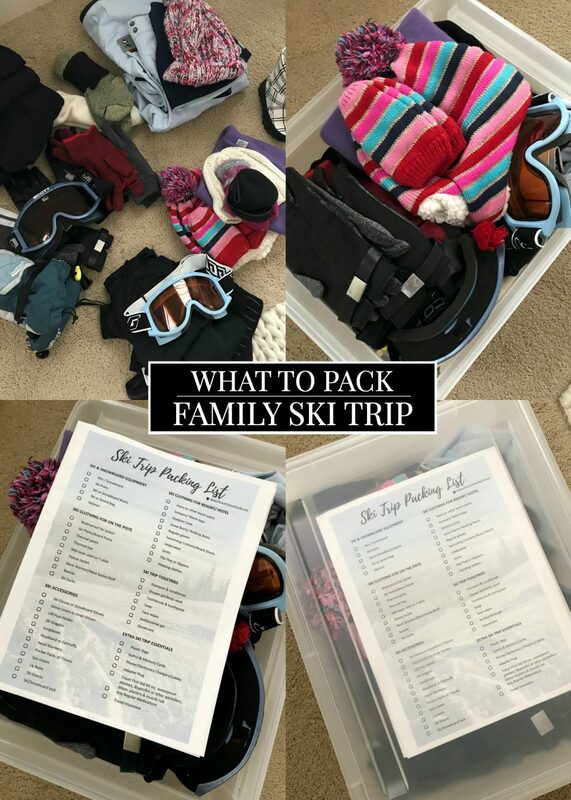 As far as packing (there’s a detailed list at the end), if your family lives in a warm climate and only skis or goes into the snow once a year, it’s worth asking to borrow snow clothes since they’ll only wear them for a few days. I put a call out on FB and several people responded, which was so very appreciated! We were able to borrow things for both of our kids. 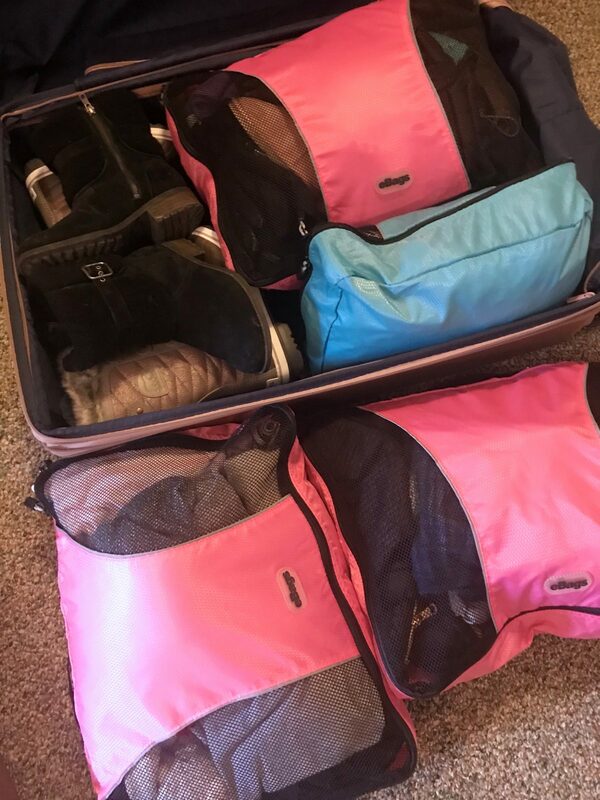 When it comes time to actually pack the suitcases, use your packing cubes ‘eBags’ (and preferably color coded ones) to keep everyone organized. 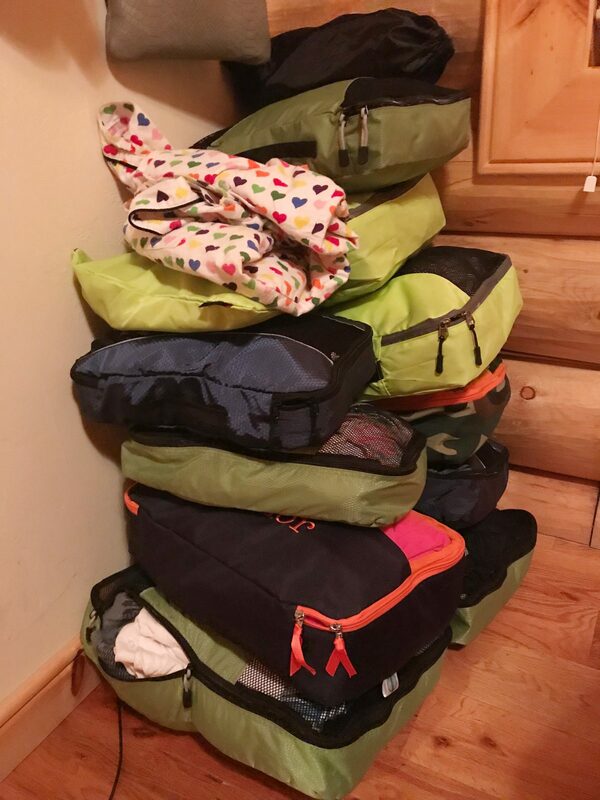 There’s so much stuff to bring skiing that it helps to keep things compact, fit in the suitcase better, and keep you organized during the trip. 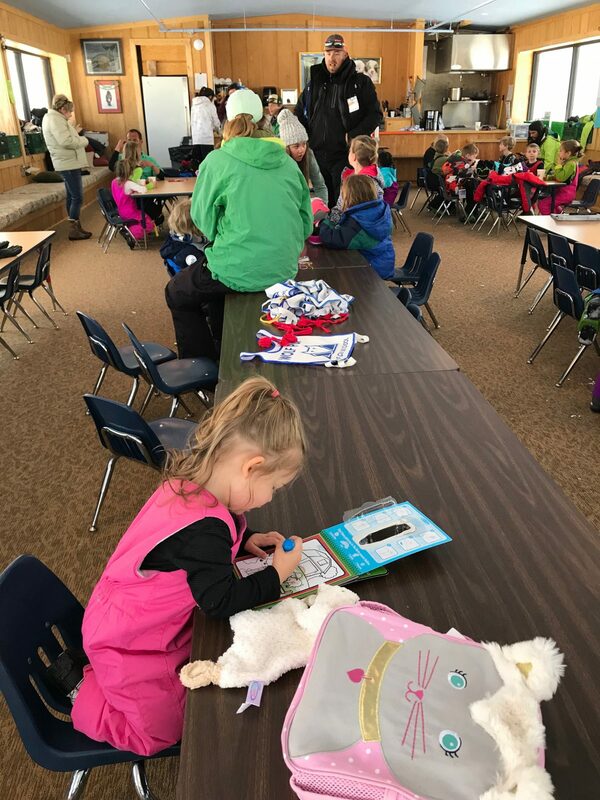 We also used our small eBags to corral the little things like gloves, goggles, sunglasses and snacks when we went to the mountain. In the interest of making this post more succinct, I including a bullet list of more tips at the end. 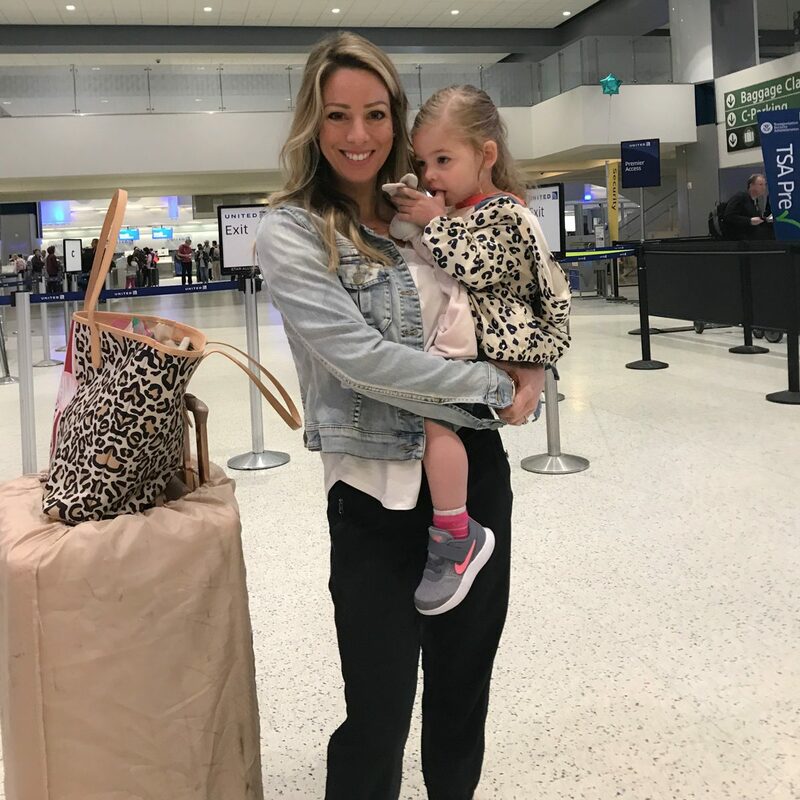 We got going pretty early to catch our flight, but we definitely remembered to bring Jordan’s ‘lovey’ that always soothes her. If your child has something similar, don’t leave home without it! She actually asked for it quite often! We also brought her favorite blanket and a couple small stuffed animals from home and I think that helped soothe her when it was time to go to sleep in a new place. Jordan actually did fine on the plane and didn’t even seem to notice the change in pressure. She got a little antsy at times, but I packed her own little suitcase with toys, games and snacks to keep her entertained. The biggest hit that kept her occupied for hours was two small containers of play dough. And also her mini iPad. She’s got a super protective case on it to keep it from getting damaged. She also enjoyed those coloring pads with water makers. 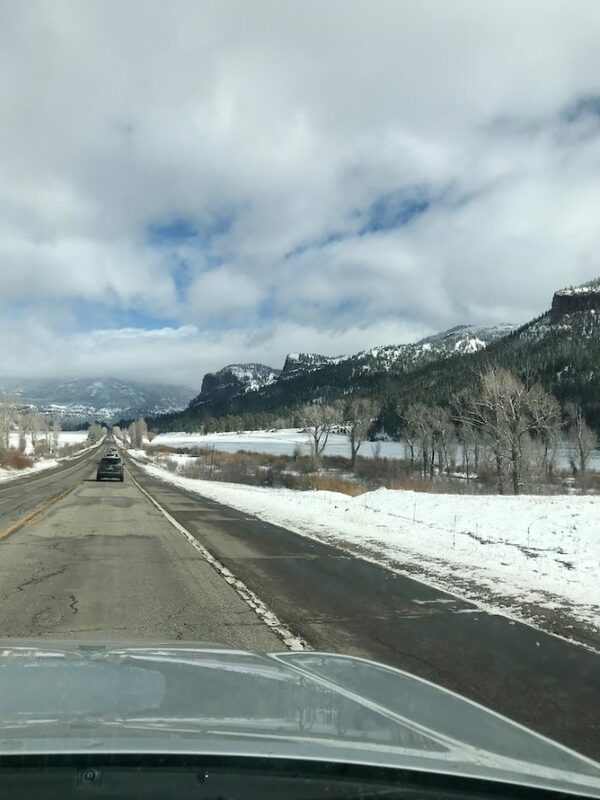 Once we landed in Albuquerque, it was a 3 hour drive to Pagosa Springs. This is part of the challenge with traveling with kids. You have to load up all of your luggage, haul it down to the shuttle to take you and your family to the rental car place. Unload all the things and people. Obtain said rental car. Haul the things and kids to the car. Pack up car, head out. All the while trying to corral a curious toddler that doesn’t want to: 1) stay with the group, or 2) listen to her parents. No! There are far too many shiny objects, new things and places to explore, and all the while the parents are trying to make sure she doesn’t hurt herself, get lost, or injure others. Deep breathe during this part and get a luggage cart if you can. 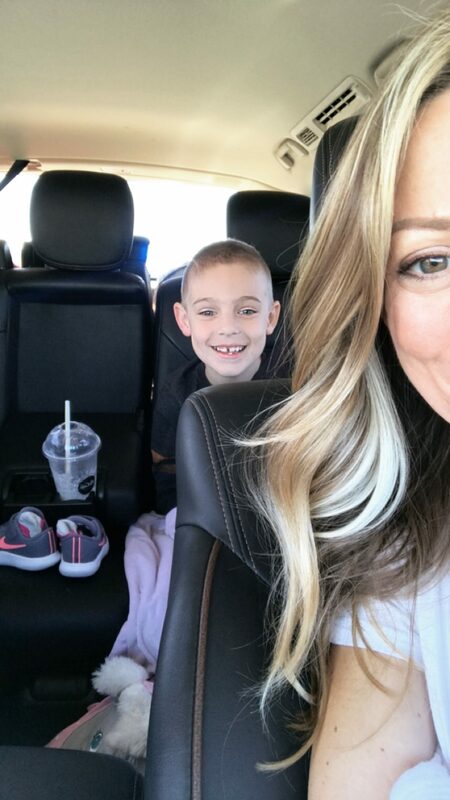 The drive itself wasn’t too bad, and I’m pretty sure our 8-year old son was mortified/impressed to meet a police office when Dad got pulled over for speeding somewhere along the way. For the rest of the trip, James was sure to call out every speed limit sign and make sure Dad knew the limit! WE MADE IT TO PAGOSA SPRINGS! But once you finally get to your destination, it feels so worth it! 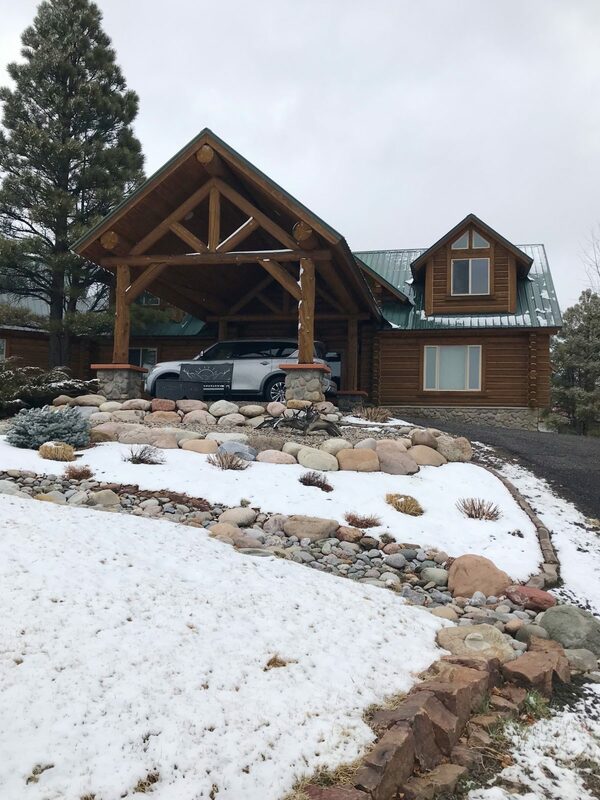 Pagosa Springs is a small town with a cozy feel and the cabin is so charming and welcoming! 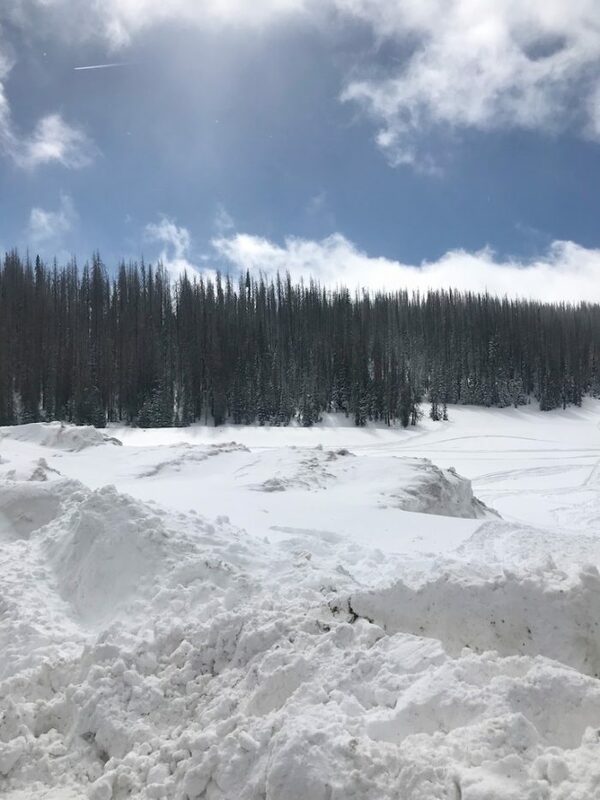 This year, Colorado hasn’t gotten much snow, but there was still enough snow on the ground for us to be impressed and play in. And it snowed more during our trip- actually quite a lot! The Sorrel boots were amazing for keeping your feel warm and dry in the snow and were comfortable to wear all day- whether on the mountain or just walking around in town. Mine are on super sale right now and are definitely worth it! They’ll last a lifetime! Because we were staying at a house, the girls went and made a big grocery store run to stock up on food/drinks for while we were there. And we went out to dinner that first night at Alley House Grill to celebrate our friend’s 40th birthday. The food was delicious, the ambiance was great, and the staff couldn’t have been nicer accommodating a party of 17! Look at this pretty view behind me! It’s definitely not something we see everyday in Houston! 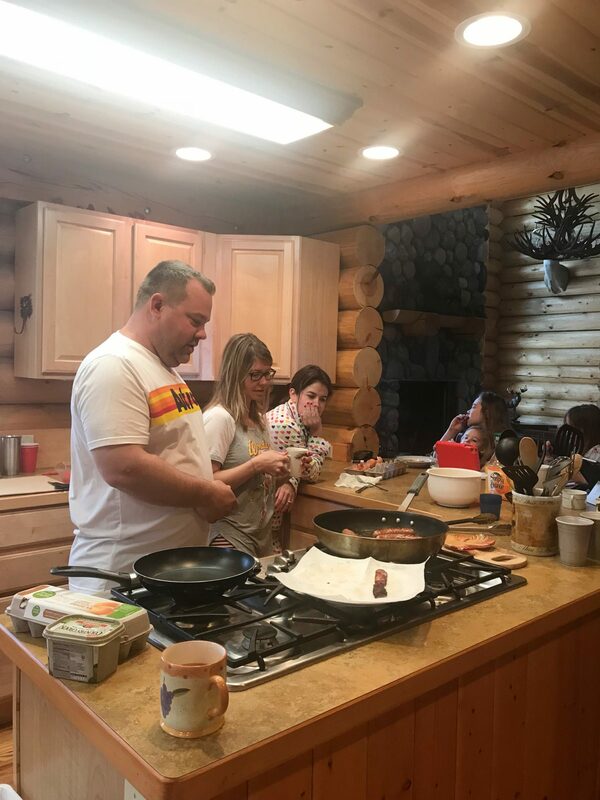 Part of the fun of staying in a cabin is getting to make your own meals and lounging around in PJs, drinking coffee and having a leisurely breakfast in the morning. This is where so many of those natural memories are made and something you might miss out on if everyone is staying in separate hotel rooms. I think we’ll laugh forever about Ali-Shaun’s burnt bacon! She’ll never live it down! 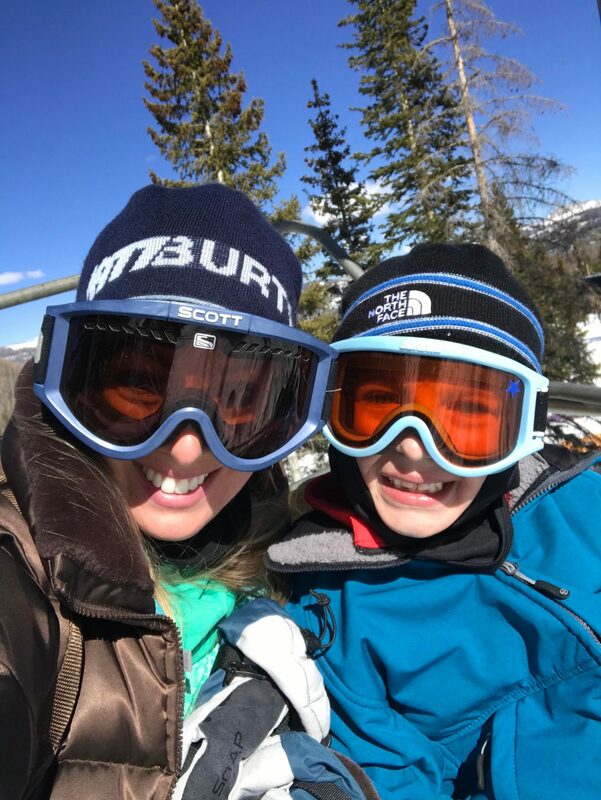 The kids were taking a 5-hour ski or snowboard lesson, so I waited back at the house with Jordan and we were planning for my husband to come back and get us at lunch and then to let her play in the snow for a couple of hours. It’s a long story, but turns out I ended up staying back at the house the whole day with her because he didn’t have cell service on the mountain and the conditions were too cold and snowy for her. James didn’t enjoy snowboarding, and ended up leaving his lesson early. The next day, we went snowmobiling and I think that was one of the most fun things we did on the trip. She was all smiles and giddy the morning of! But, it was also one of the most frustrating when we actually got to the place where we snowmobile. 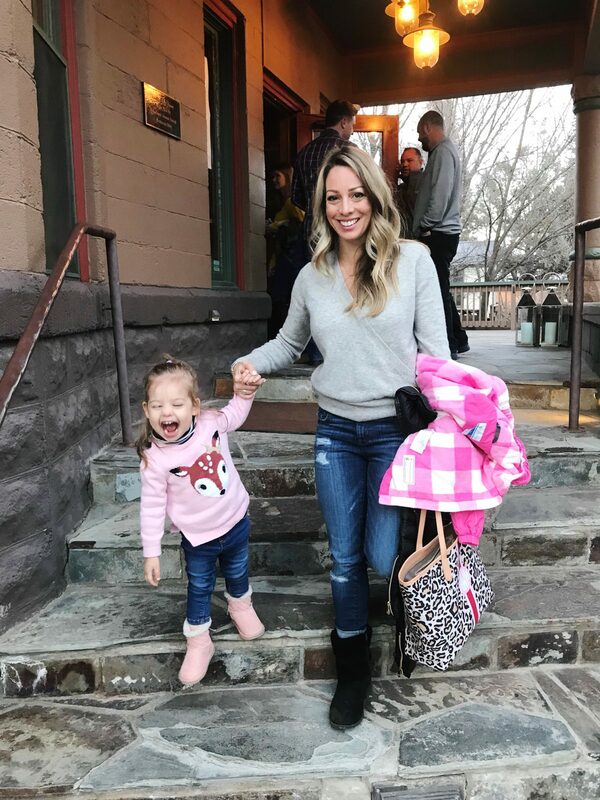 Jordan hated being all bundled up for the first time, her boots and gloves weren’t staying on, and she was having an epic meltdown. And this is just out of the car, before we even got to the trailer where you get your helmet on. After struggling with her for a long time while she continued screaming crying and melting down, I told my hubby that he needed to take her back to the cabin- it just wasn’t going to happen. 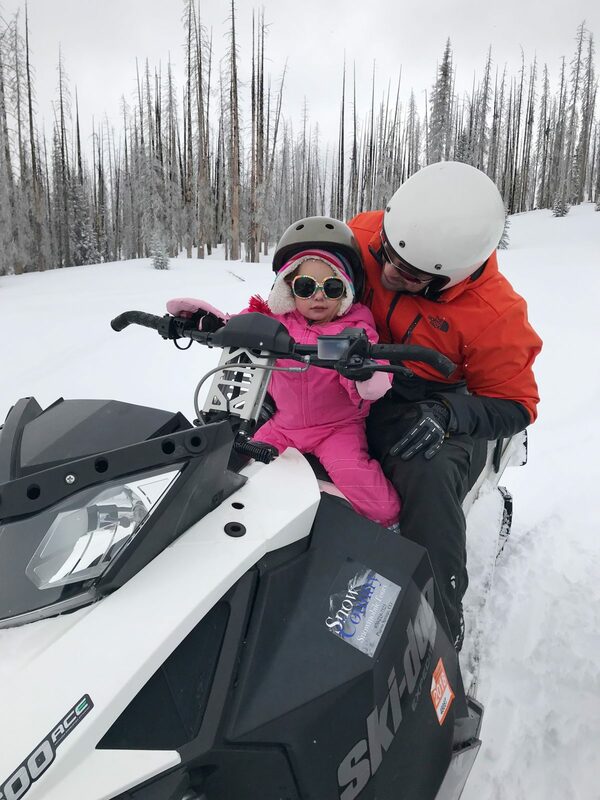 He took her back to the car and James and I went on the snow mobile tour with the others. 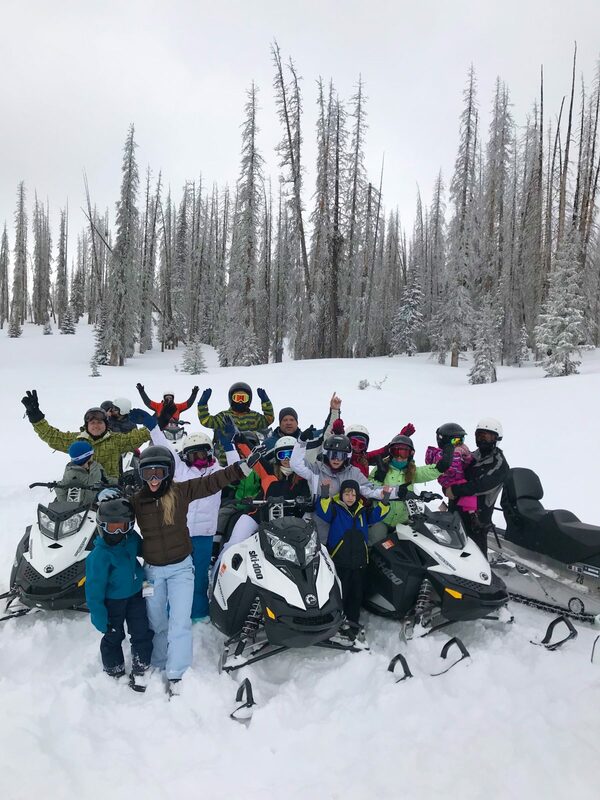 I was sad that they weren’t going to get to be able to go snowmobiling with us, but knew it was only two hours and then we’d meet up for the hot springs, the next thing on the agenda. 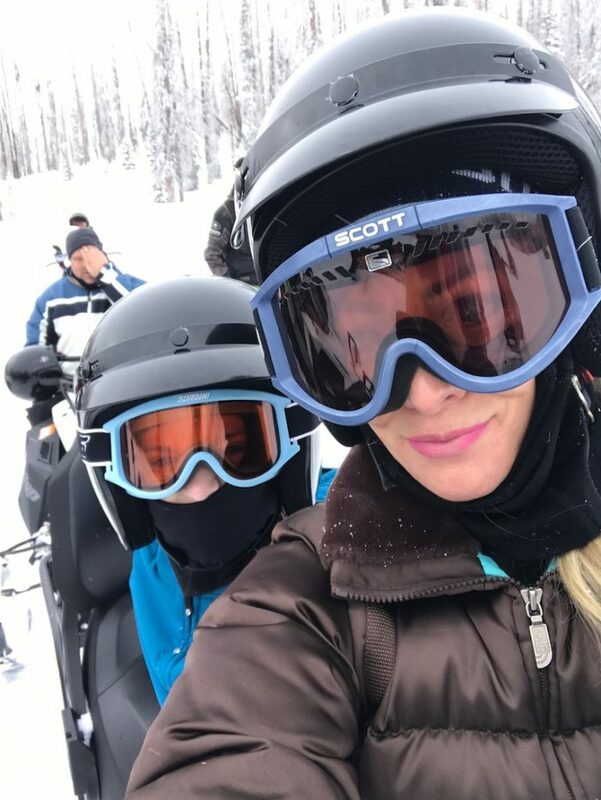 I’ve never driven a snowmobile before, so I was a little nervous, but it’s actually quite easy and super fun! 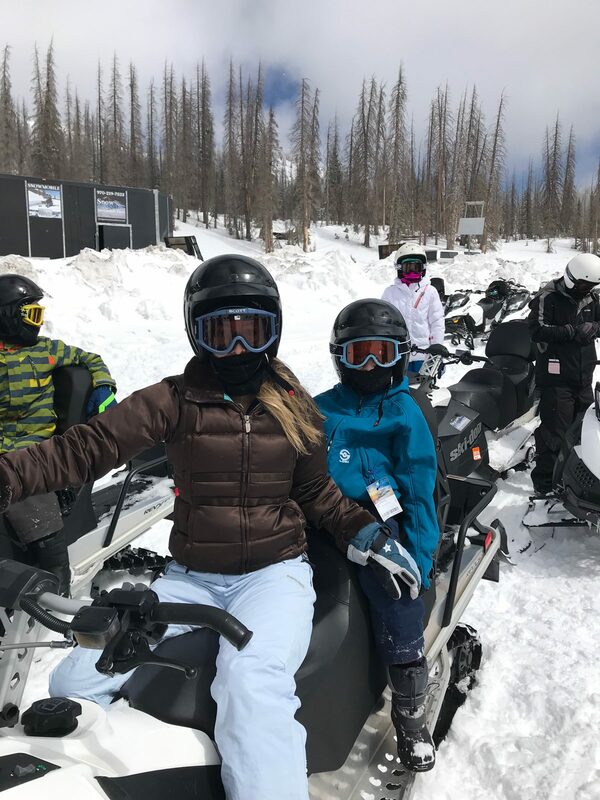 We were having a lot of fun, not going too fast, and touring the mountain for about 45 minutes when our guide stopped and imagine our surprise to see Jordan and my hubby ride up on a snowmobile! The guide ended up telling me that they had a one-year old on the tour that loved it the week before, and even a 5-month old that the parent was wearing. I’d definitely recommend bundling up because it gets cold while you’re driving and the wind is in your face. Jordan and Dad rode super slowly (her in front) and she did seem to like it. In fact, the ride rocked her to sleep! 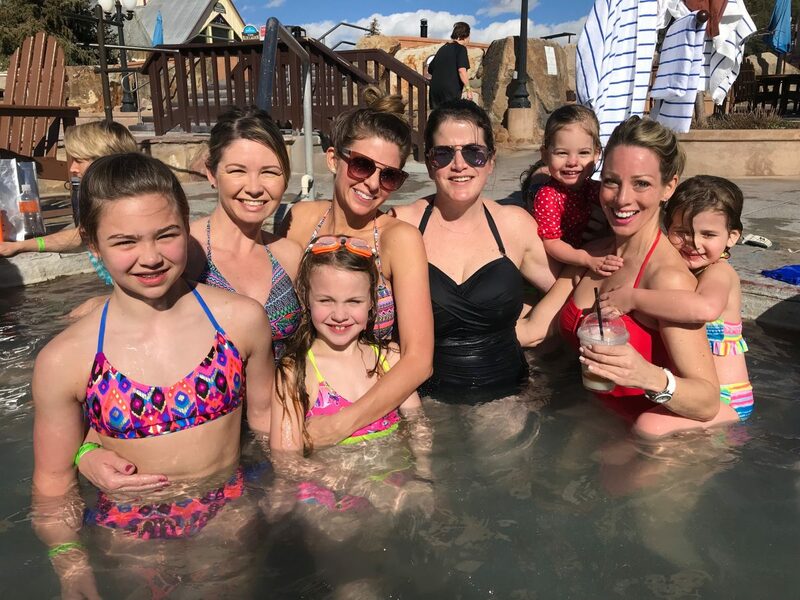 We drove straight from snowmobiling to the Hot Springs! 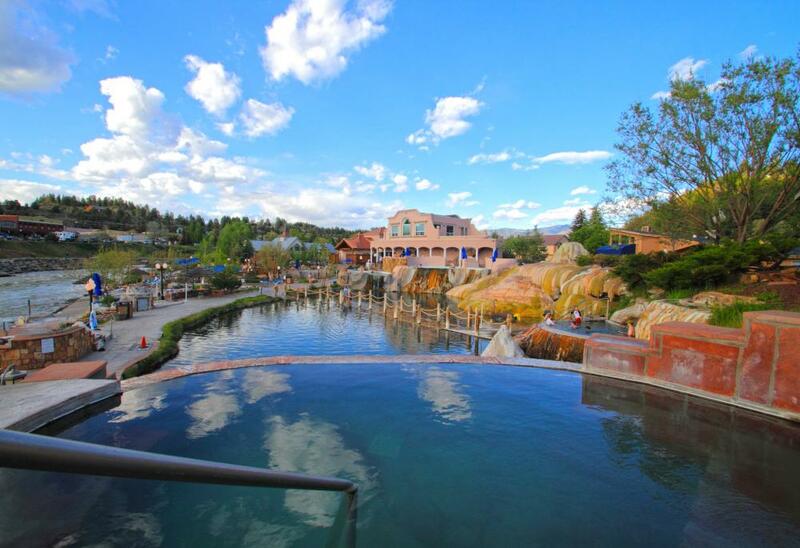 Pagosa Springs has mineral rich hot springs and you can experience them at The Springs Resort & Spa, Healing Waters Resort & Spa and the Overlook Hot Springs Spa. We bought admission to the first one, but didn’t stay there at the resort. It’s the craziest and coolest thing being outside in 40° weather and then stepping into a 90° swimming pool! Later that night we went on a wagon ride to dinner. This was one of those places that offer is three menu choices: prime rib, salmon, or chicken. And it comes with appetizers and desserts. 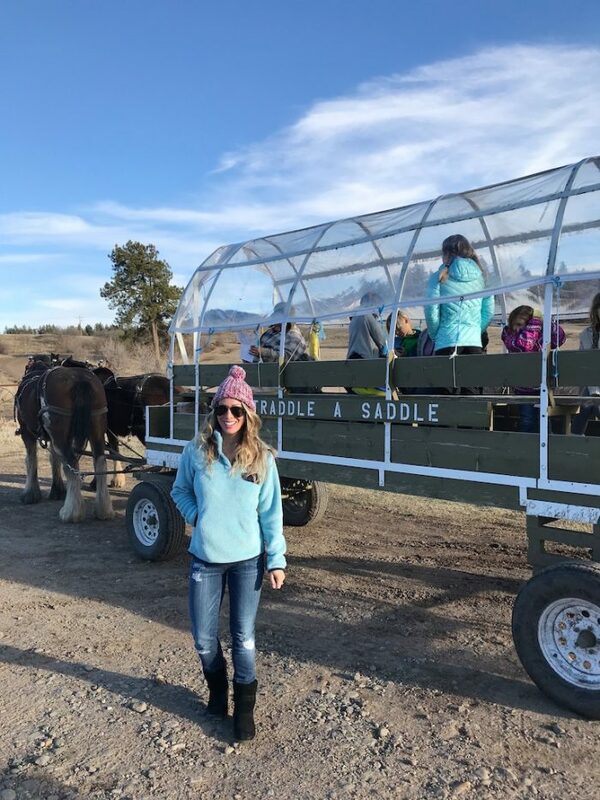 The wagon ride is just about 10 minutes to and from the quaint little cabin where you eat. We went into town to shop and explore for a little while before heading skiing again. The kids were anxious to do another day of skiing and snowboarding in this time only had a two hour lesson so we brought Jordan along and agreed to take turns watching her while the other parent skied with our son. This time we rented skis in town, one so that we wouldn’t have to wait in the long line at the mountain. I asked if Jordan was old enough to ski and they said they go by weight and not age. 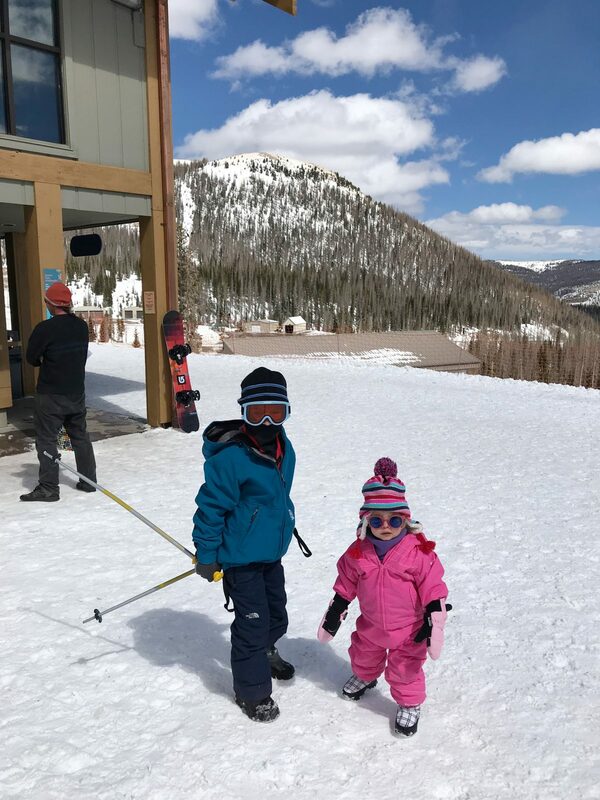 35 pounds is the recommended weight for their first time skiers. Jordan weighs 27 pounds. 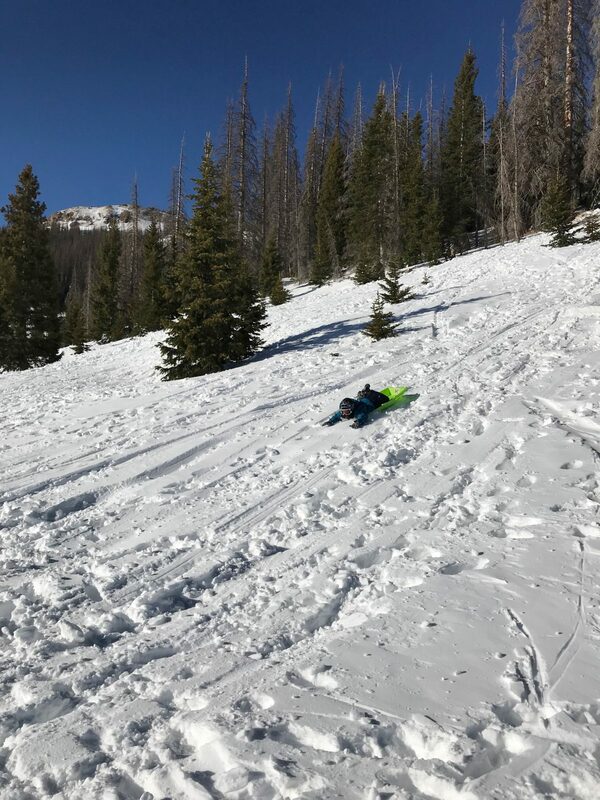 But they also mentioned that most toddlers don’t have the attention span, motor skills or physical strength to ski under age 3 or 4. It depends on your child’s level of maturity. 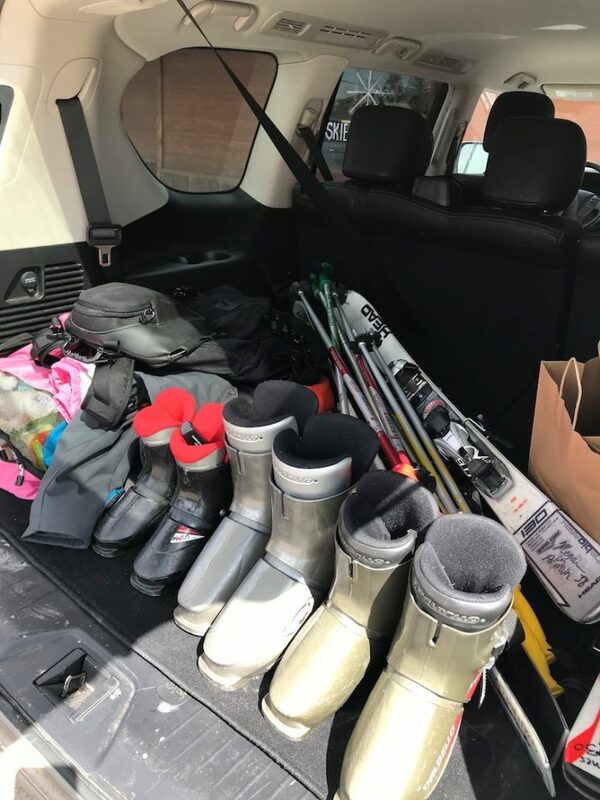 The downside of renting gear in town is that then you have to lug all of your skis and boots up the mountain from the car. It’s a lot of gear! 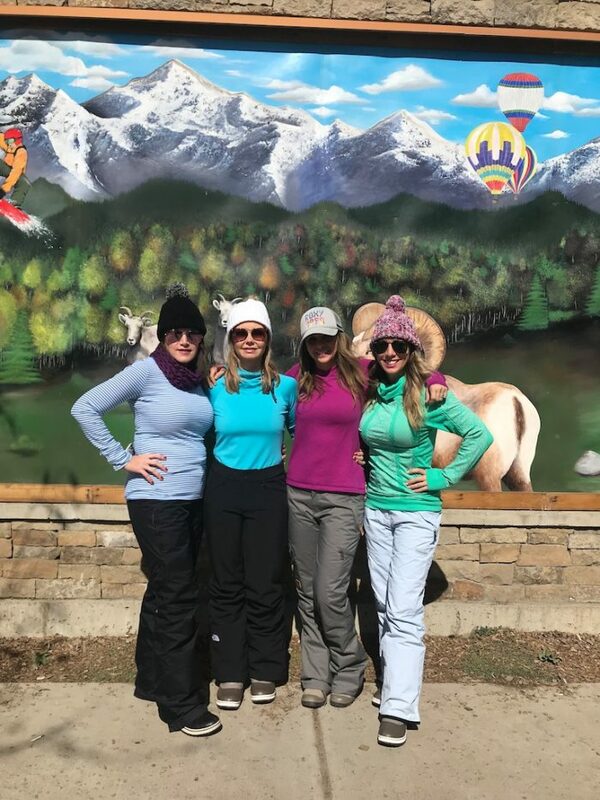 In order to make it up the mountain in one trip, we had to get another adult help us carry skis and boots. But once you get up to the mountain it really is worth it! The views are spectacular and when you stop to take it all in, it is just amazing seeing God’s creation. 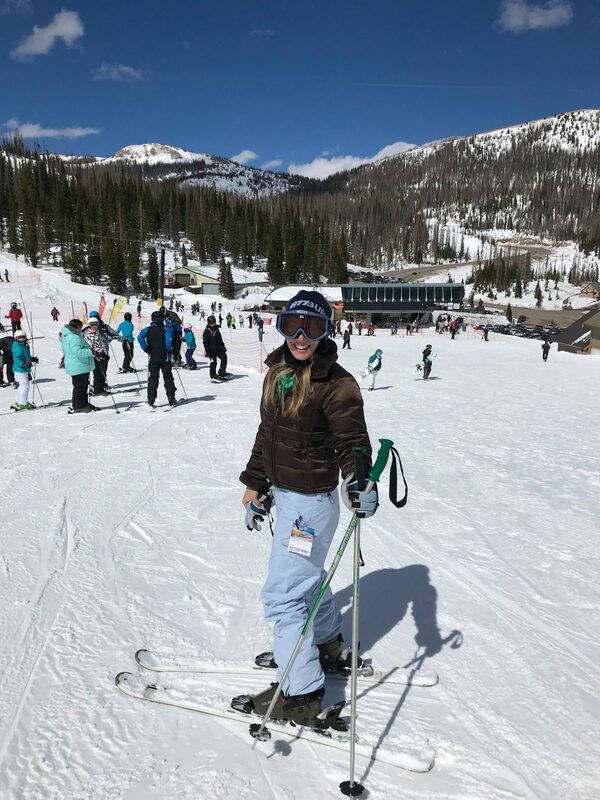 I’m not a great skier, but I love getting up on the slopes. 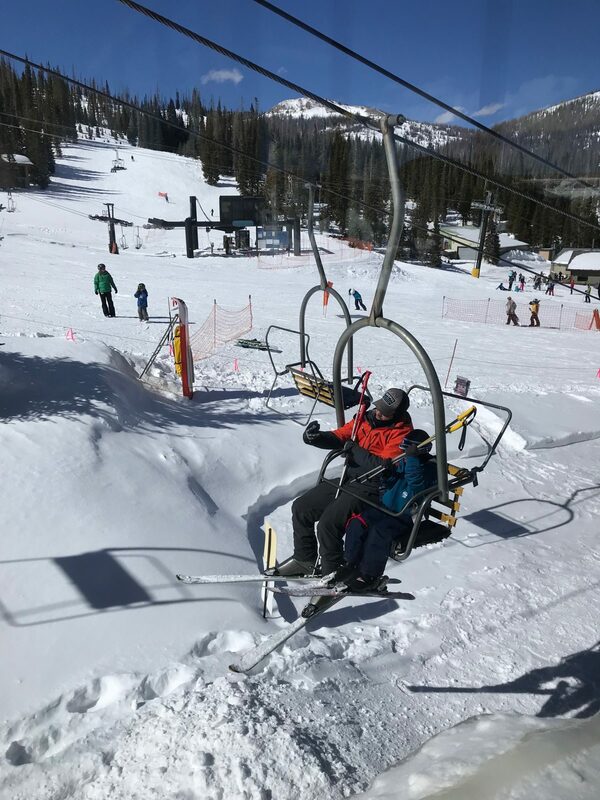 After James’s lesson, his dad and I took turns skiing down the bunny slopes with him. He’s probably a better skier than both of us! The kids that did a second snowboarding lesson were actually getting the hang of it on day 2 and loved it! Jordan had fun just sitting in a sled, but actually preferred being inside at the lodge and just playing with her toys and looking out the window and exploring the lodge. Everything is new for a two-year-old so just being in a different place is exciting and adventurous. The same things we brought on the airplane kept her quite content at the mountain. One of our friends has an almost 13-year-old daughter that Jordan quickly became attached to. She was so great with Jordan and actually a huge help during the trip. 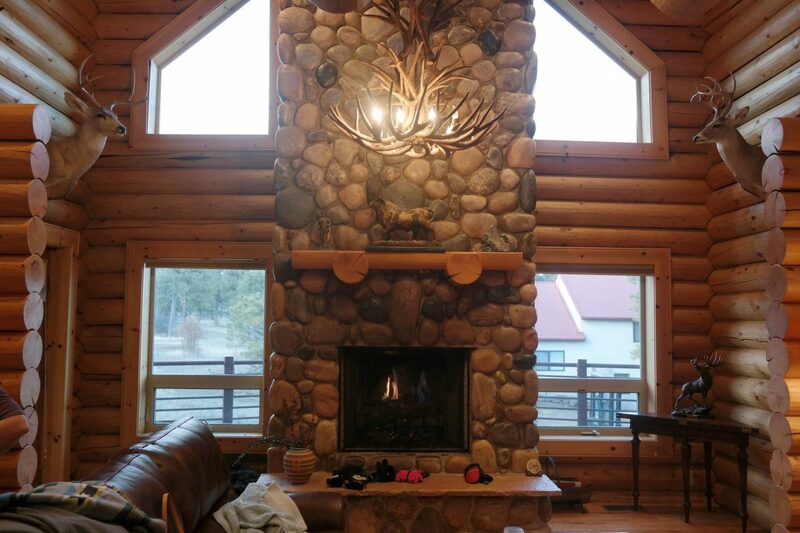 After skiing, we stopped at the lodge to grab snacks, take a break and chill out for a bit before going sledding! The spot to sled was on the way home from the mountain so we pulled over, trekked over to what look like a good place and went for it! Those kids have so much energy to climb up that hill repeatedly and sled down. Jordan I just watch them played in the snow while the kids sledded. After we got back into the car after sledding, James said, “every boy has to do a crazy stunt before he can become a man.” Ha! No matter how much fun you have while you’re away, it always feels great to get home! Having those eBags to separate the dirty laundry helps on the return. You can just empty them into the laundry room when you’re unpacking! Ali-Shaun is hip to the eBags too. She gave them as her Favorite Thing two years ago! For the car ride back to the airport and on the flight home, comfort is KEY! I wore my wide waistband super opaque leggings, a pajama soft v-neck tee, and of course, my cozi cardi! The Barrington bag in this size makes a perfect travel tote (it’s super sturdy) and I often like to wear flip flops if I feel like my feet have swelled and I want to be able to kick off my shoe in the car or on the plane. 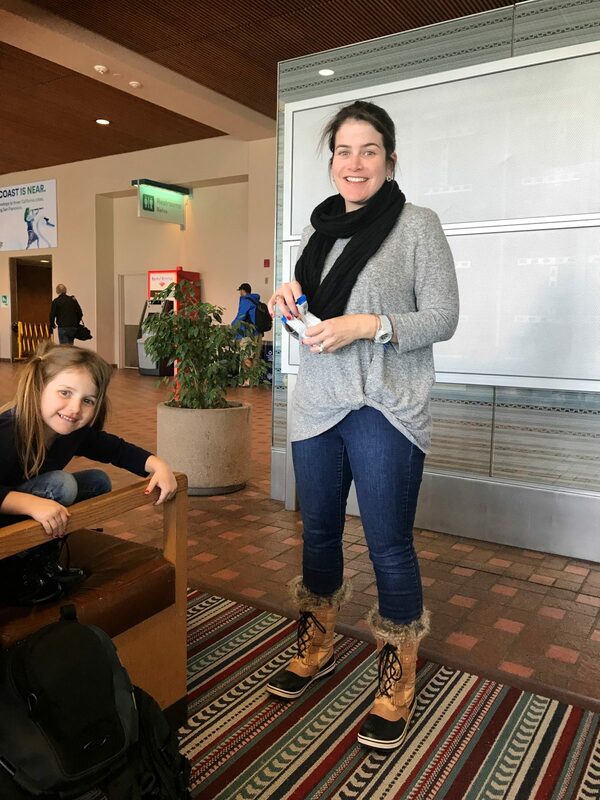 Ali-Shaun was smart to save luggage space by wearing her Sorrel boots to and from Colorado- and the cozy twist front top she got at our first Style A Friend post! Speaking of, we need to do a second one soon! 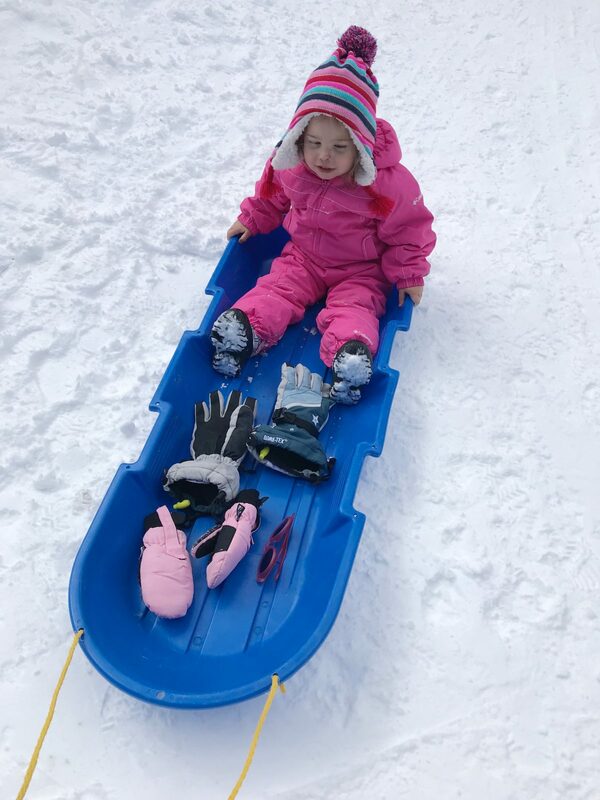 Try on Snow Gear Before Your Trip – it can be difficult for your toddler get used to wearing all that gear with hat, gloves and eye protection, so have them “play dress up” ahead of time. 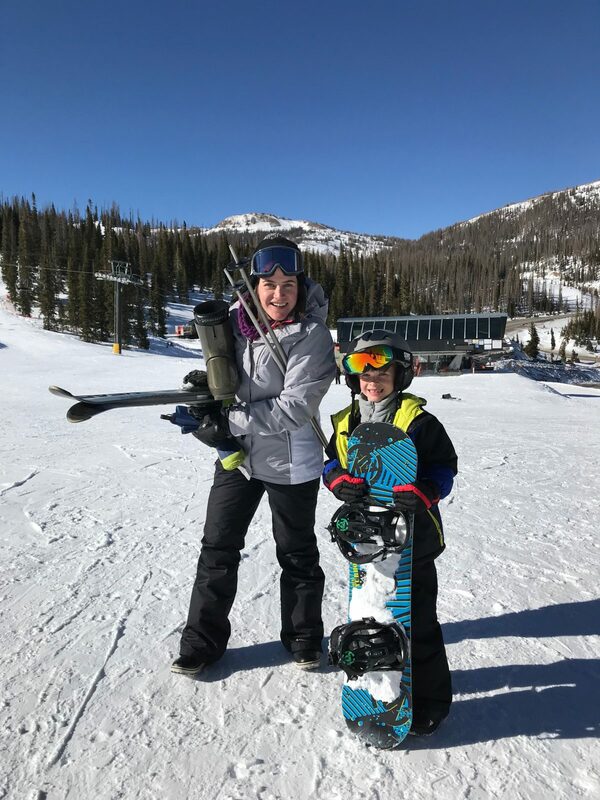 Ski-In and Ski-Out Access to the Mountain – there’s so much gear to carry (and often the toddler needs to be carried too), so mountains with ski-in and out access make this easier. 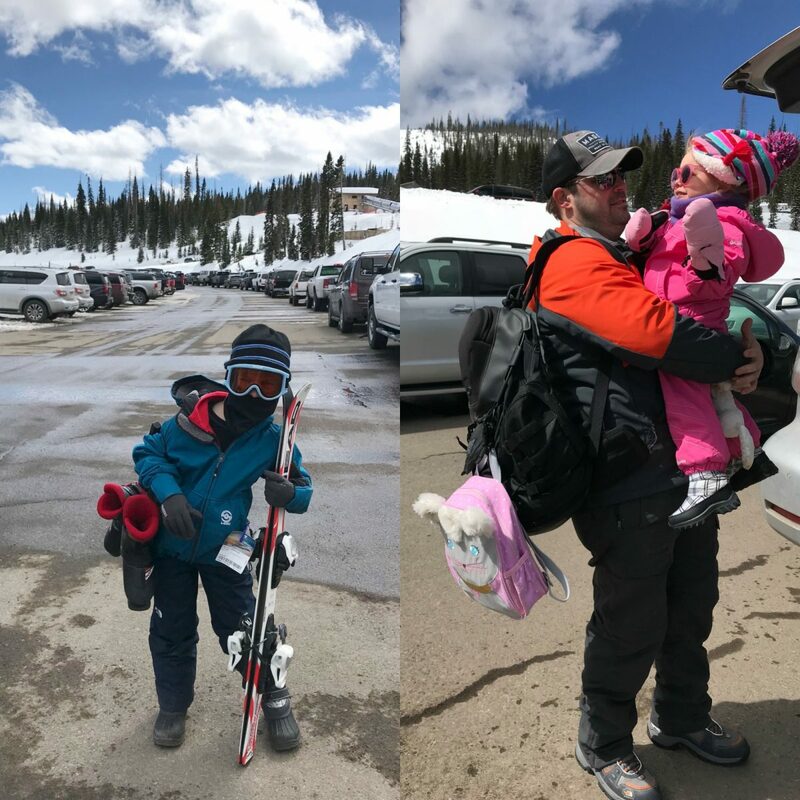 My husband and son had to make 3 trips back to the car when we were finished skiing while Jordan and I waited at the lodge. 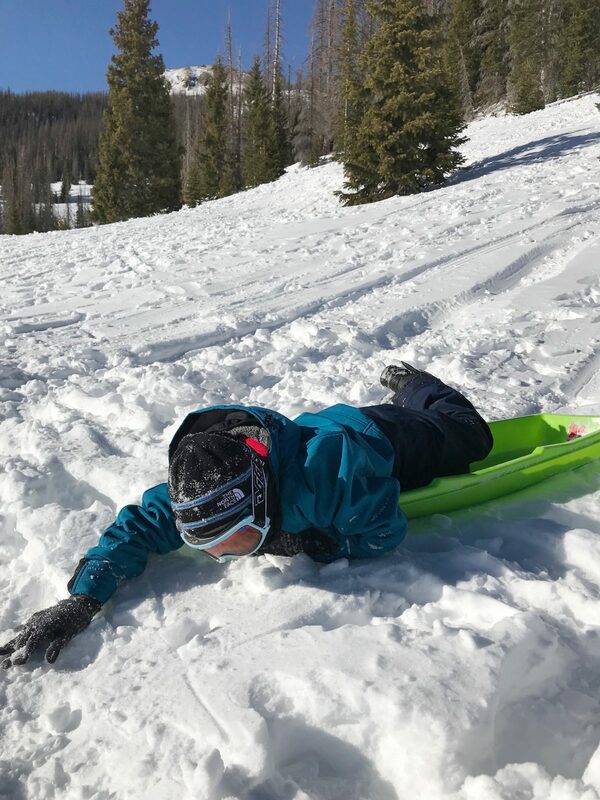 Check Ski School Ages – the mountain we went to (Bear Creek) didn’t offer lessons for kids under age 3. But, they did give us toddler sized boots and skis for Jordan to play in (at no charge), although we never made it that far. 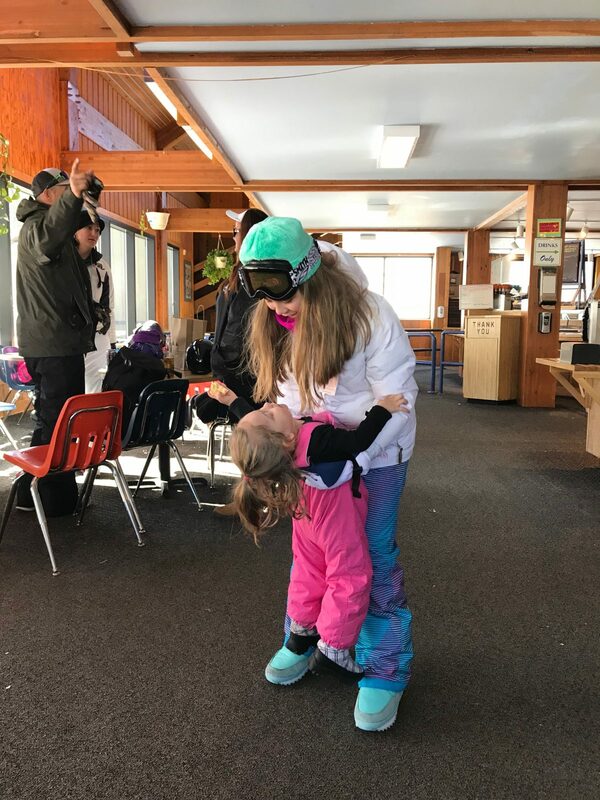 Like I mentioned above, whether or not your child is old enough to ski depends on her attention span, motor skills and physical strength to handle a day of skiing. 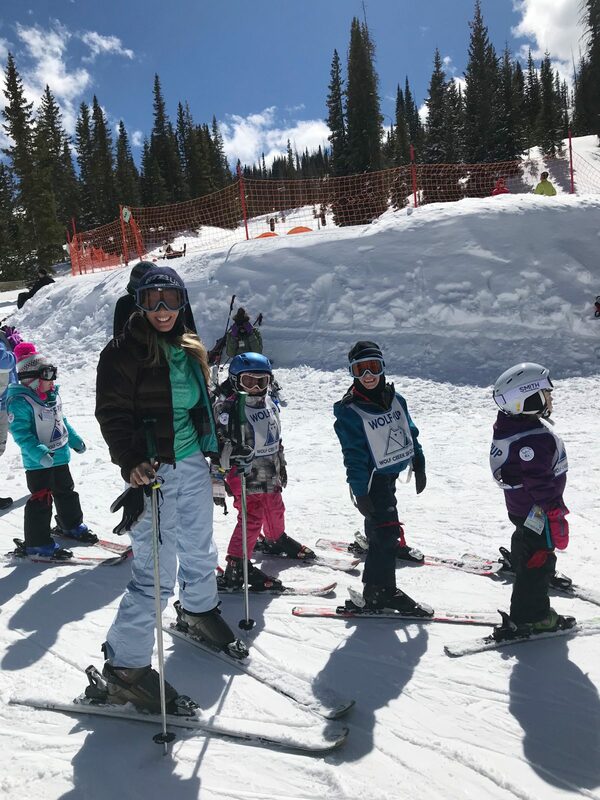 You should also consider how well your child takes instruction, their comfort with ski instructors, and how well they can handle the cold and snow. 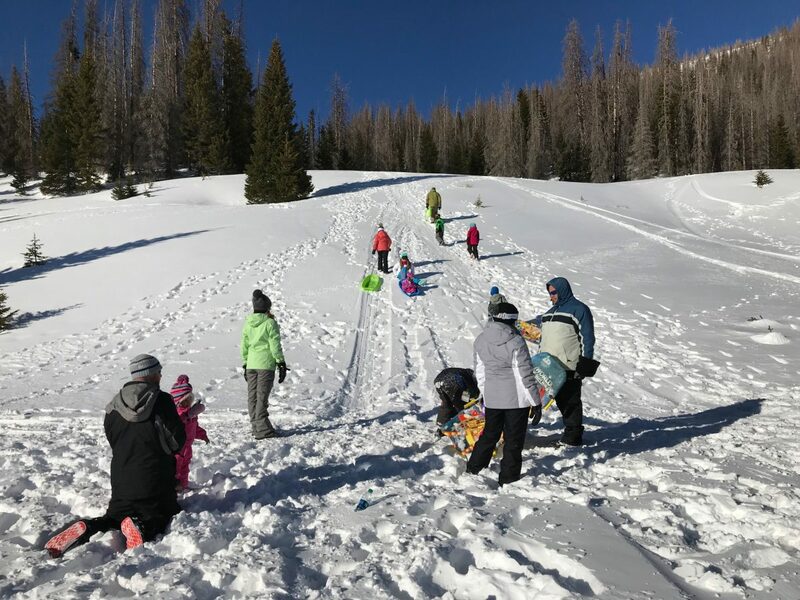 Call ahead for Childcare – our mountain didn’t have childcare, but many do! Pack Toys – but not too much. Young kids are likely to be entertained just by being in a new environment. Bring Snacks – avoid a hangry situation! Keep in Mind Your Child’s Limits and Nap Schedule – What might look like ‘bad behavior’ is just your child needing sleep. Jordan can often skip a nap, but then will need to go to bed earlier that night. Lounge Clothes – you want something comfy for when you get back to the house/hotel for just lounging around in. 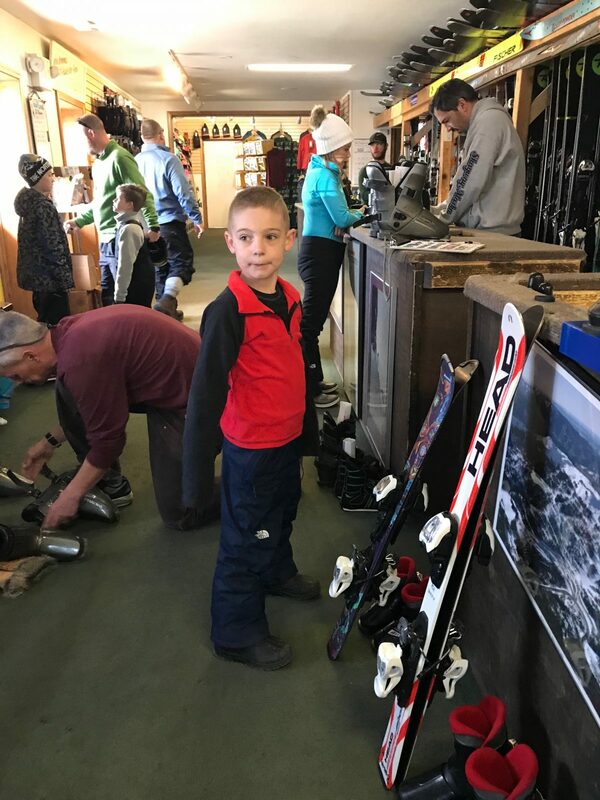 Bright Colors – If you do have your choice of ski clothes (ie- not borrowing), bright colors help you easily identify your child on the slopes. Phew! That was a lot! If you stuck with me, thank you!! 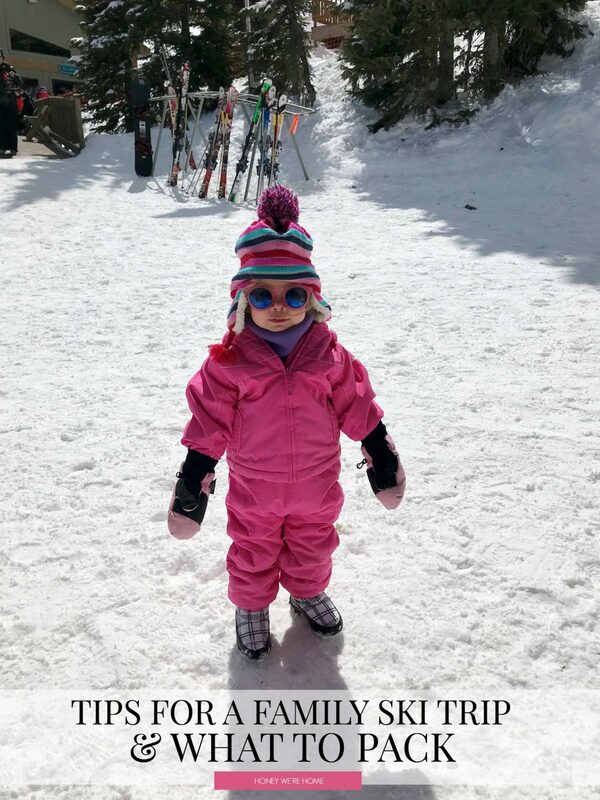 What are your best tips for a ski vacation with a toddler? I’m really glad we went! It’s a ton of effort, but worth it in the end! 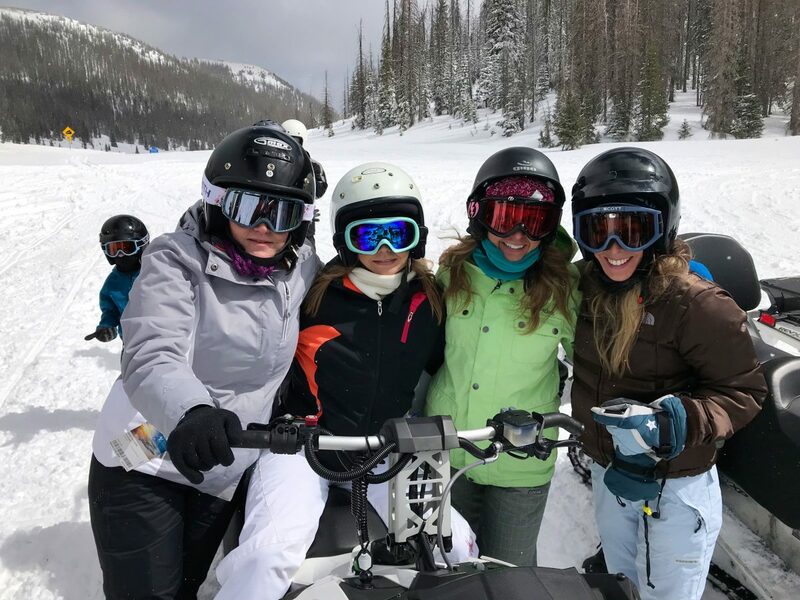 Looks fun but as a Colorado girl, I would choose a different spot for a ski vacation with kids. Keystone, Breckenridge, or Vail. Lots of kids programs and a shorter drive from Denver International Airport. I think this is why I like beach vacations more…less gear! Sounds like you all had fun! Right! Shorts, flip flops, bathing suit and good to go! We thought for a minute about leaving Jordan behind with my mom, but we wanted her to be with us. The hauling all the gear is one of the most challenging parts, so the ski in/out sounds dreamy!! Since you’re familiar with skiing, I bed you’d like snowmobiling! I was searching of blogs about travelling to NYC and I saw this blog of yours. It caught up my attention and this this really great. I like what your family did during the holiday. Thanks so much Sarah, we had a great time! I hope we can go back!